Back in October, PJ and I were in Washington, D.C. 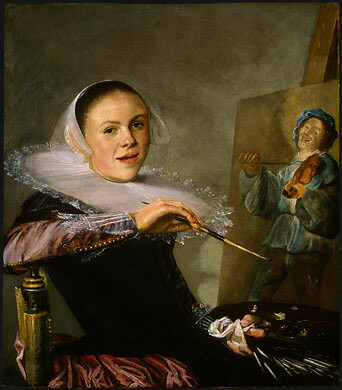 While there, we visited the National Gallery of Art, which at the time had a special exhibit on seventeenth-century Dutch painter Judith Leyster. Since I’m about to head off to the Netherlands for a week (more about that sometime this week), I’ve decided to make Leyster my hottie of the month. Leyster, pictured here in her self-portrait at the age of 21 in 1630, was born in 1609 and died in 1660, which means that she lived just long enough to make my hotties list (which generally covers the period from 1660 to 1820). She was well-known in her own time but quickly fell into obscurity after her death. The pamphlet that accompanied the exhibit suggests two possible reasons for her disappearance. 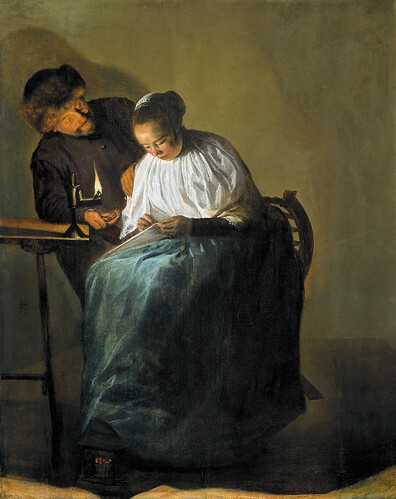 First, she largely stopped painting after she married in 1636. She married another painter, and her work became more of a collaboration with him. Thus, her individual identity was lost. Second, the pamphlet suggests that her habit of signing her paintings with just her initials might have contributed to her subsequent neglect — people may have simply forgotten who the initials stood for. Both of these explanations seem plausible, especially since women in all fields of art were so often neglected after their deaths. In my own period and national literature there are countless examples of this, including Aphra Behn, Katherine Philips, and “Ephelia,” whose identity remains shrouded despite efforts to identify her. Fortunately, we now value these women’s contributions to art and their cultures enough to recover them and their works. Leyster’s paintings are mostly portraits and genre scenes, paintings of couples, groups of people playing cards or otherwise engaged in entertainments of one kind or another, and a still life. This particular exhibit, which has since left the National Gallery of Art, framed her work with the museum’s seventeenth-century Dutch collection, which was a great way to see and understand her work, obviously. It really allowed the viewer to assess what she was doing that was similar to her male peers and what she was doing that was different. 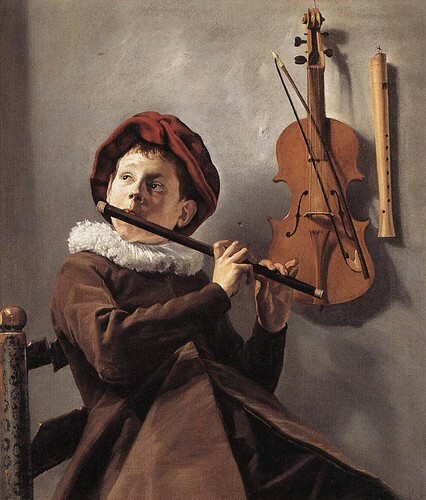 What stood out to me in the exhibit were the paintings involving musical instruments, like this one, “Young Flute Player,” which was painted around 1635. The color palette of this painting is similar to browns, reds, and greys of Diego Velázquez, an almost exact contemporary of Leyster. I love Velázquez’s work, so I mean that as a compliment. I like the artists of this period who are able to take what should be rather drab colors and make them come alive in the painting. While the color scheme here is rather limited, the painting doesn’t actually come off that way. As the pamphlet indicates, one of the appealing aspects of this painting is Leyster’s use of “natural light” to illuminate the flute player, which I think is what allows the painting to avoid seeming drab. The play with light adds a touch of realism to the painting and allows her to demonstrate her skill with contrasting shadows and brightness. The boy’s shadow in the wall is especially masterful, I think. It’s also interesting to note that the back of the boy’s chair is broken. Again, this adds realism and makes the image even more interesting. Instead of “natural light,” this time Leyster plays with a single lantern shining on a young woman and her suitor. This light is much less powerful and more yellowed, again a nice touch of realism. As the pamphlet notes, this painting along wither others explores the “complexity of male-female relationships.” Is this man a lover or a predator? Does the woman welcome his proposition or fear it? Wikipedia has a few other examples of her work. I enjoyed seeing her paintings for the first time and hope to see more soon. Nice posting. There are so few female painters that achieved recognition in the past. Obviously it wasn’t an activity women were eager or even allowed to embrace unless it was part of the family business. Even in that most feminine of periods, Rococo France. I strongly recommend the reading of Mme. Vigee LeBrun’s Memoirs.